Equitable Life, Life Insurance : Assurance Vie Michel Levesque Life Insurance - Serving: Bathurst, Beresford, Nigadoo, Petit-Rocher, Campbellton, Tracadie-Sheila, Caraquet, Shippagan, Miramichi, NB (New Brunswick). Equitable Life was first established in 1920 as The Ontario Equitable Life and Accident Insurance Company. 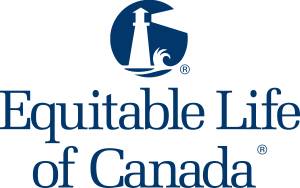 Since 1936, the company is now known as The Equitable Life Insurance Company of Canada. The headquarters are located in Waterloo, Ontario. The company has locations from British Columbia to Ontario and in the Atlantic provinces. Also since 1982, they also have locations in Bermuda. The firm is committed to providing the best possible and most suitable products to its policyholders. Having no shareholders, the policyholders are eligible for company dividends. Individuals are offered life and health insurance, retirement planning, commercial mortgages and savings services. For small and medium-sized businesses, the company offers group benefits. Equitable Life offers their Final Protection plan. This is a simplified issue whole life insurance policy. Providing up to $50,000 in insurance, there is no medical exam required. Applicants need to answer a few basic medical questions and premiums are guaranteed. The company also offers their Living Protection plan. This is a simplified issue critical illness insurance. Living Protection covers four of the most common illnesses in Canada today. Again, there is no medical exam required. There are a few basic medical questions and the premiums are guaranteed. The maximum amount of insurance is $50,000. We work with many of the top Canadian insurance companies. Several insurance companies mean we are able to present the best insurance products available. We read the fine print and understand the products we bring to our clients. If you feel insurance in complicated or expensive, you need to contact us. We can show you how easy and affordable insurance can be. Get started on the best insurance quotes HERE.